Ekai Kawaguchi (1866-1945), a Buddhist monk known as an early explorer of Tibet, was the first Japanese visitor to Nepal. Having studied the Tibetan language in Darjeeling, the 34-year-old Kawaguchi came to Nepal in 1899 with the goal of secretly entering Tibet, which was then closed to foreigners. Originally he hesitated about whether he should go to Tibet via Bhutan or Nepal. Eventually he chose the Nepal route, considering that even if he failed to enter Tibet, Nepal had many Sanskrit manuscripts which deserved to be thoroughly investigated and studied, as well as many sacred Buddhist pilgrimage sites. He was also interested in the fact that no Japanese had ever been to Nepal. 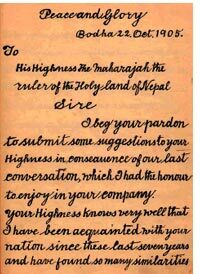 A final reason for choosing the Nepal route was an encounter in Darjeeling with a Nepali by the name of Jit Bahadur K.C., who wrote a letter of introduction to Rev. Buddha Vajra, the "Chiniya Lama" of Boudhanath, who later hosted Kawaguchi in Kathmandu. After collecting information on various possible routes into Tibet, Kawaguchi proceeded to Tsharang in Mustang via Pokhara, Tukche and Marpha. In Tsharang, he studied Buddhism and Tibetan rhetoric under the guidance of a Mongolian Buddhist scholar. Then he retreated to Marpha, and ultimately succeeded in secretly crossing the Tibetan border via a pass in the Dhaulagiri Himal. Kawaguchi stayed for about two years in Tibet, pretending to be a local Tibetan. Eventually his nationality was revealed, and he was forced to leave Tibet. He escaped with great difficulty and returned to Darjeeling, where he learned that several Tibetan friends who had helped him had been arrested by Tibetan authorities. Kawaguchi determined to visit Nepal for the second time, hoping that Prime Minister Chandra Shumsher Rana would transmit his letter of petition to the 13th Dalai Lama to release his Tibetan friends. Kawaguchi also requested the prime minister to accept a set of the Japanese Buddhist Sanskrit manuscripts for Nepal. He returned to Japan in May 1903, but came back to Nepal in March 1905 and presented the prime minister with the 100-volume set of the Tripitaka. This set is at present kept at the National Archives in Kathmandu. In response, Prime Minister Chandra Shumsher instructed government officials to collect various Sanskrit manuscripts and presented them to Kawaguchi. Kawaguchi also collected many Sanskrit manuscripts himself, as well as Buddhist scrolls, paintings, and religious objects. Chandra Shumsher Rana from Rev. During his third visit to Nepal, while waiting for the collection of the Sanskrit manuscripts, Rev. Kawaguchi wrote a long letter to Prime Minister Chandra Shumsher, which is preserved in the Madan Pustakalaya. In the letter, he propounded the unity of Asia and Pan-Asianism and described Nepal as the birthplace of Gautam Buddha, who spread the precious teaching of "Light and Moderation". Believing that Nepal deserved in exchange the opportunity to benefit from Japanese science and technology, he offered several suggestions for the development of the country, in the areas of education, political and financial administration, industrial development and the building of socio-economic infrastructure. Rev. Kawaguchi was thus the first Japanese to consider the possibility of extending Japanese cooperation in the development of Nepal. A memento of Kawaguchi's Himalayan travels exists in Japan, in the Buddhist temple of Obaku-san Manpukuji on the outskirts of Kyoto. Here Kawaguchi pursued various Buddhist disciplines when he was young. Two tall Himalayan cicada tower near the gate of this temple. It is said that the saplings of these trees were brought to Japan from Nepal and were planted there by Kawaguchi. As mentioned above, one of the reasons Kawaguchi took the Nepal route to Tibet was Nepal's abundance of sacred Buddhist pilgrimage sites. In 1896 the Ashoka Pillar had been discovered in Lumbini, the birthplace of Gautam Buddha. Kawaguchi must have heard about this discovery at the time. In 1912, he visited Lumbini on pilgrimage, accompanied by Prof. Junjiro Takakushi, Rev. Ryutai Hasebe, and others. The local people of Lumbini at this time had mistaken the image of Maya Devi, the mother of Buddha, for a Hindu deity, and were offering animal sacrifices to it. It is said that at Kawaguchi's request, Prime Minister Chandra Shumsher issued a decree prohibiting animal sacrifices at Lumbini.